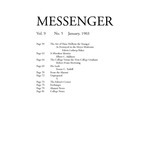 Bard College, "The Messenger, Vol. 9, No. 5 (January, 1903)" (1903). The Messenger, 1894 - 1930. 16.